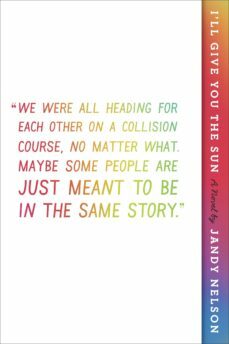 The New York Times Bestselling story of first love, family, loss, and betrayal for fans of John Green, Jojo Moyes, Emma Straub, and Rainbow Rowell. At first, Jude and her twin brother are NoahandJude; inseparable. Noah draws constantly and is falling in love with the charismatic boy next door, while daredevil Jude wears red-red lipstick, cliff-dives, and does all the talking for both of them. Years later, they are barely speaking. Something has happened to change the twins in different yet equally devastating ways . . . but then Jude meets an intriguing, irresistible boy and a mysterious new mentor. The early years are Noah’s to tell; the later years are Jude’s. But they each have only half the story, and if they can only find their way back to one another, they’ll have a chance to remake their world. This radiant, award-winning novel from the acclaimed author of The Sky Is Everywhere will leave you breathless and teary and laughing—often all at once.